The Philippian jailer's question is as pressing for us as it was for the man who originally asked it. God is holy, and we are not. God cannot stand to look upon sin. How then can we, as sinners, be saved? This book delves into Scripture and church history to explore the Protestant doctrine of justification by faith alone, and in so doing, it points to Christ alone as our hope for salvation. 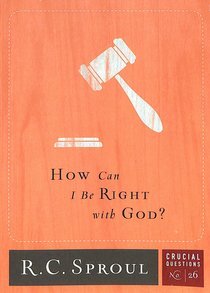 About "How Can I Be Right With God? (#26 in Crucial Questions Series)"